Everyone has someone in their life who absolutely LOVES coffee, including drinking multiple cups a day. They're never seen without a cup in their hand and will never turn down another Starbucks gift card... And there's a lot of them. 44 percent of U.S. consumers stated that they consume two to three cups of coffee per day on average. That totally includes us! You know we love a good cup of organic, fair trade coffee over here at SHE. So, we loved collecting some exceptional products that will allow loving coffee to be a sustainable, healthy, ethical activity! Handmade in New York, this beautiful set lets you make your perfect cup at home. Jane & William understands that making things at home always makes the product richer and more meaningful. That's why all its products are handmade in upstate New York. This coffee pour over set helps you achieve your perfect brew at home. This three-piece set comes with the pour-over, pitcher, and lid. Look for food grade stainless steel or gold options. Finding silicone instead of plastic is a great upgrade! Add a sustainable touch and gift your friends a reusable coffee filter to use instead of paper versions! Bundle it with a mug or coffee. We love this one for drip coffee makers or this cone-shaped filter for pour-over versions (which is great because it has a silicone and not a plastic outer ring!) Key note: Look for high-quality, food grade metal versions! Slow mornings are made more enjoyable with a warm cup of coffee and a delicious smelling candle nearby. With these enamel mugs from United By Blue, you can do both. They start out as a candle made out of soy wax with a cotton wick. After 40 hours of burning and a little bit of scrubbing, it turns into your newest mug. The mug is hand-dipped in Europe and the candle is poured in the USA! These durable mugs begin their life as a soy wax candle. A great read deserves great coffee! Six 4 oz. single origin coffees from six of the countries explored in Javatrekker, Dean's award-winning book. WHOLE BEANS. This book beautifully displays that the major issues of the twenty-first century-globalization, immigration, women's rights, pollution, indigenous rights, and self-determination-are played out in villages and remote areas around the world. Human beings were made to create. Create conversations, create memories, and create a good cup of coffee. The Created Co.'s mission is to give you the tools to create all of those things through their line of stainless steel drinkware. This particular tumbler will let you take your coffee wherever the day takes you, while the design on the outside will be sure to let everyone know how much you love the beverage inside. Not to mention part of the profits from your purchase go to build wells and provide clean waters in third-world villages. Everyone on your Christmas list would love a to-go themed coffee mug. The trademark of a coffee-lover is a mug in hand, but this tee will declare your love for all to hear. Made out of organic cotton it's so soft you will never want to take it off! This tee is made by autistic adults in the USA. Providing them with meaningful work that lasts demonstrates how AWESOME they really are! 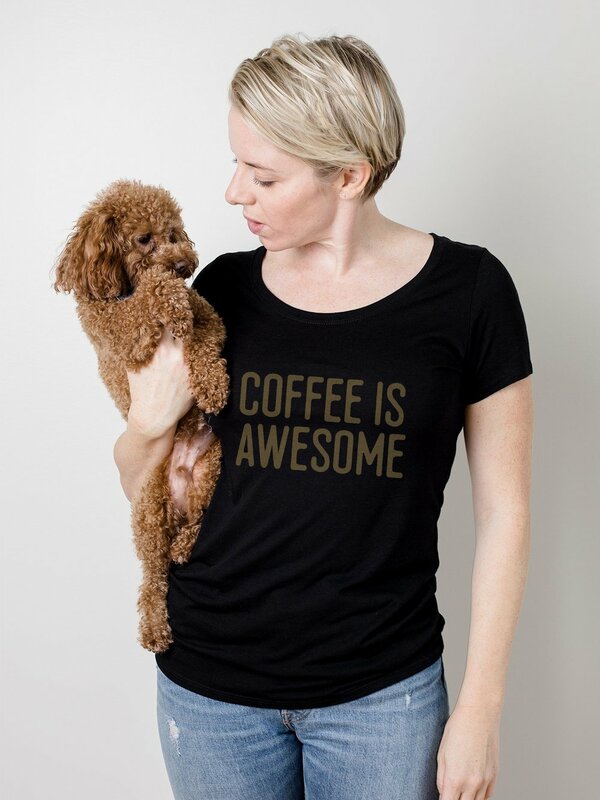 Every coffee lover needs a shirt that tells it! And gives back! This handmade coffee mug with 22k gold accent will elevate your friends' coffee game! The photo doesn't do it justice. Coffee just might taste a little sweeter in this handmade mug. Achieve the perfect blended, frothy beverage with this ingenious tool. Who doesn't love a good latte? Better yet, who doesn't love a creamy, frothy, perfectly blended latte? One of the downsides of making them yourself is that you can't achieve that perfect blend. With the Aerolatte, you froth the milk with no trouble at all. It's also great for mixing powders or matcha to get all of the clumps out. We love it so much that we have a video tutorial on how to use it right here and are giving it away for one of our 12 Days of Christmas Giveaway. This quality leather coffee sleeve is perfect for mason jars to take your coffee to-go. We also adore the coffee sleeves from Latte Knots and But First Coffee Shop. An electric coffee grinder is the best way to help you maintain the taste and quality of your organic coffee. Grinding your coffee beans right before you brew them helps you get the best taste and quality. This article goes into detail why, but a good rule of them is that fresh is always best. Buy grinding your own beans, you have more control over your brew. This small electric coffee grinder won't take up too much counter space and grinds just the right amount of beans. If you're looking for a plastic-free version then check out this hand-held grinder from Amazon. A coffee mug holder made out of reclaimed wood is a great wall-hanging, and gift. The coffee lover in your life probably owns an abundance of mugs, potentially even a whole cabinet full of them. Pretty mugs need to be seen and what better way than to display them on your wall? Especially if it's made out of reclaimed wood! There are plenty of fun coffee mug holders on Etsy big enough to store mugs but small enough to not take up too much wall space. Looking for bags of coffee? Check out some our favorite fair trade, organic brands: Cameron's Coffee, Dean's Beans Coffee, Elisha C., Ethical Bean, and Equator Coffee. It's hard to find a water-processed decaf coffee that is organic, but dean's beans makes several amazing varieties! This coffee from Haiti is award-winning, organically grown, and quality-made. Each and every bag of coffee that leaves the ethical bean roastery is stamped with a unique QR code so you can track the journey your coffee has taken to get to you. Are there any other sustainable, healthy, ethical coffee products you think should be on our list? Are there any coffee products you wish you could find ethically made? Let us know in the comments!